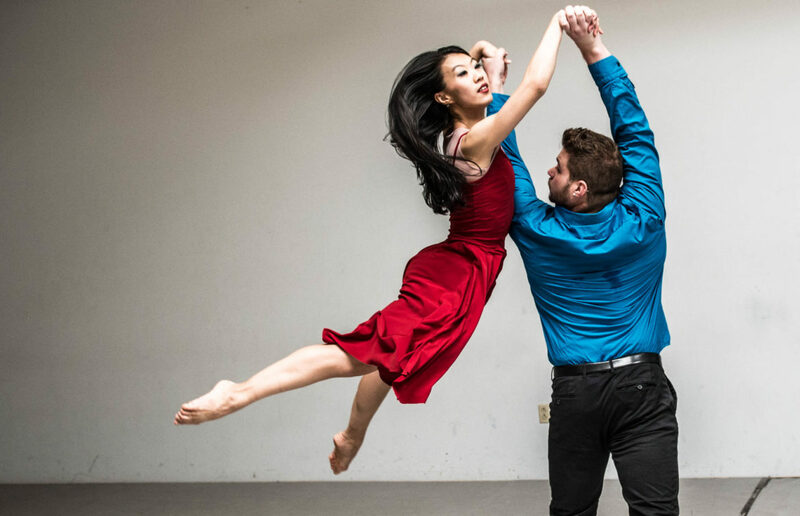 Presented by the Arts Alliance of Northern New Hampshire, the contemporary dance troupe Lorraine Chapman The Company comes to North Conway on Sunday, April 8, with a day of workshops and an early evening performance at the Jeanne Limmer Dance Center. The April 8 afternoon program for experienced dancers includes four workshops: 12 p.m. Dance & Flow with Emily Jerant-Hendrickson; 1 p.m. Contemporary Ballet Barre with Lorraine Chapman; 2 p.m. Contemporary Technique & Exploration with Marian Rasmussen; and 3 p.m. Falling & Flying with Jacob Regan. Workshops for all those interested in participating, ages nine through adult, include a 2 p.m. introductory Dance & Flow workshop with Emily Jerant Hendrickson and a 3 p.m.Introduction to Ballet with Lorraine Chapman. These will be held at the Branch, next door to the Jeanne Limmer Dance Center. The 5 p.m. company performance, open to the public, includes excerpts from a work-in-progress, “Accordion Interrupted;” an excerpt from “The Zealous Laborers” (an exploration of the legacy of the Shakers); and “Salute,” a trio piece examining communication and the power of gesture, which will be followed by an interactive improvisation. Lorraine Chapman, one of New England’s most respected dancers and choreographers, is this year’s Extending the Dance Map regional artist in residence, working with dancers — and non-dancers — on contemporary dance and interdisciplinary movement. Lorraine has presented at several events at Plymouth State University and will continue to visit northern New Hampshire throughout the spring, working solo and with company members at schools and dance studios as well as nursing homes, businesses and in other nontraditional or unexpected dance settings. Pricing: $15/Workshop for experienced dancers or $10/Class at the Branch. $50 for the whole day — includes four classes and the evening performance. Evening Performance: $5/student, $10/adult, $20/family. Pay at the door with cash or check. The Arts Alliance invites all those interested to attend; anyone who would like to come but can’t afford the ticket fee, can pay what they can or come as a guest of the Arts Alliance. Lorraine Chapman The Company’s residency is coordinated by the Arts Alliance in partnership with the Plymouth State University Dance Program, and supported in part by the New England States Touring Program of the New England Foundation for the Arts, made possible with funding from the National Endowment for the Arts Regional Touring Program and the six New England state arts agencies, including the New Hampshire State Council on the Arts. The Arts Alliance is also grateful for operating support from the Neil and Louise Tillotson Fund of the NH Charitable Foundation. The Arts Alliance of Northern New Hampshire is a regional membership organization working to promote, support and sustain culture, heritage and the arts in Northern New Hampshire. The Arts Alliance has assembled an exciting slate of programs for its 30th Anniversary Season, including Experience/Arts, a program that brings eight weeks of arts classes to older residents through a partnership with Grafton County Senior Citizens Council. Upcoming regional artist residencies around the region include a theater and puppetry residency. Preregistration is encouraged for all April 8 programs. Call(603) 323-7302, or visit the Arts Alliance website atwww.aannh.org.